New Price! Spectacular French Country Executive with a Premier Perch and Enchanting Woodland Backdrop! Claim the Treasured Privacy and Tranquility You Seek! Pride of Original Owners is Evident Throughout! 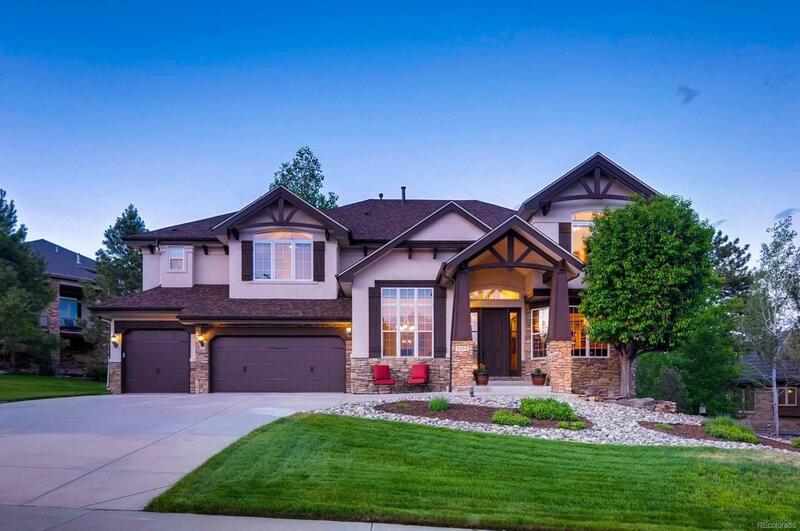 The Glorious Grounds Offer So Many Areas to Savor Our Fabulous Colorado Alfresco Lifestyle with Expansive Back Deck, Covered Patio and Generous Level Backyard...All Embraced by Magnificent Mature Trees! The Impressive Timber-Trussed Covered Front Entry Hints at the Delights Within! Fresh Neutral Paint, Gleaming Hickory Floors and Soaring Ceilings Enhance the Light & Airy Open Concept Floor Plan! Expansive Windows Usher in Natural Light and Verdant Views of Lush Trees! A Gorgeous Fireplace Anchors the Heart of the Home, the Spacious Family Room! The Gourmet Kitchen Features Slab Granite, Stainless Appliances, Upgrade Hickory Cabinetry and Flooring! The Extraordinary Walkout Level Offers an Ideal Versatile Layout for Entertaining, Relaxation, Mother-in-Law/Second Master Suite!